Our cab/ driver will pick you from Jaisalmer city at around lunchtime. You will be received with a traditional welcome & you will check-in at your Camp or AC Cottage. Jeep safari dune bashing tour, where the jeep will pick you from the campsite. Later enjoy the famous camel safari tour at Sam, along with a stop at Sam’s sunset viewpoint. 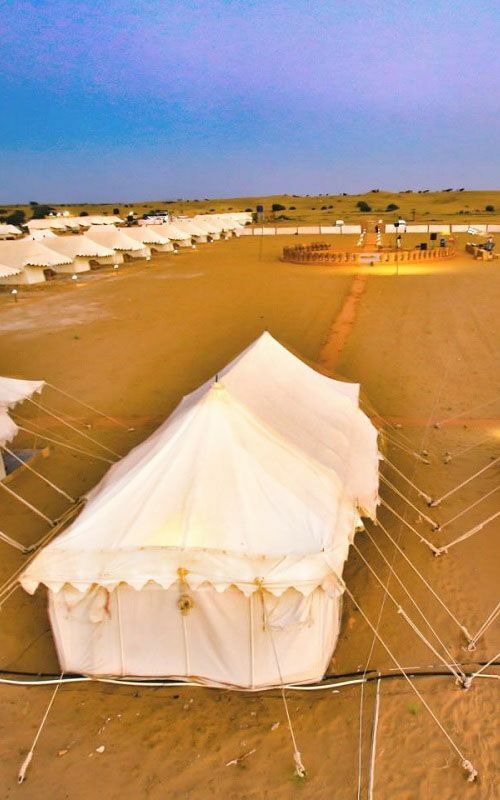 Be back at the camp by 7-8 pm & enjoy a live Jaisalmer Gypsy dance show with buffet dinner. Show timing at the camp is from 7:30 pm to 10:30 pm & later you can rest at your booked camp or cottage. Our suggested camps are Rajputana Desert Camp, Dangri Desert Safari Camp and Dune Safari Camp. Click the blue links to view these camps images, amenities, location etc. Afte the breakfast at the booked camp, we will leave the campsite & head back to Jaisalmer city. On route, we will visit the beautiful Amar Sagar Jain Temple & Kuldhara haunted village. Visit more sites near Jaisalmer city like Bada Bagh, Vyaas Chatri & Jaisalmer War Museum till 8 pm. Get more details & a free tour planning consultation on our desert camp package by calling at +91 9414796344 or filling the form below. Quiz: Which number is bigger, 2 or 7 ? A list on all tourist places of Jaisalmer.